In the year 1889 a number of LDS families left the Oak City and Leamington, Utah area and moved to what is now known as Star Valley, Wyoming. These families knew each other and probably planned the move together, although we don't know for sure if they all traveled together. Elders of these groups were Thomas Morgan and John Whitlock Radford. John Lovell, who was the elder statesman, had died in 1881. About twelve related Morgan, Radford and Lovell families made this move, including John Lovell's son Joseph Hyrum Lovell and his family. Joseph Hyrum Lovell's wife, Leah Ellen Radford Lovell, was a daughter of John Whitlock Radford and this family tie probably explains why the Lovell Family chose to move to Wyoming with the Morgan's and Radfords. The move to Wyoming was basically a disaster, with all the families losing most of their livestock during the harsh winters, and starvation an ever present threat. After two years in Wyoming, the above mentioned families moved from Wyoming to the Ririe, Idaho area, where they successfully settled. The Morgan, Radford and Lovell families have left a permanent legacy in the Ririe, Idaho area, with large numbers of descendants still living there today. 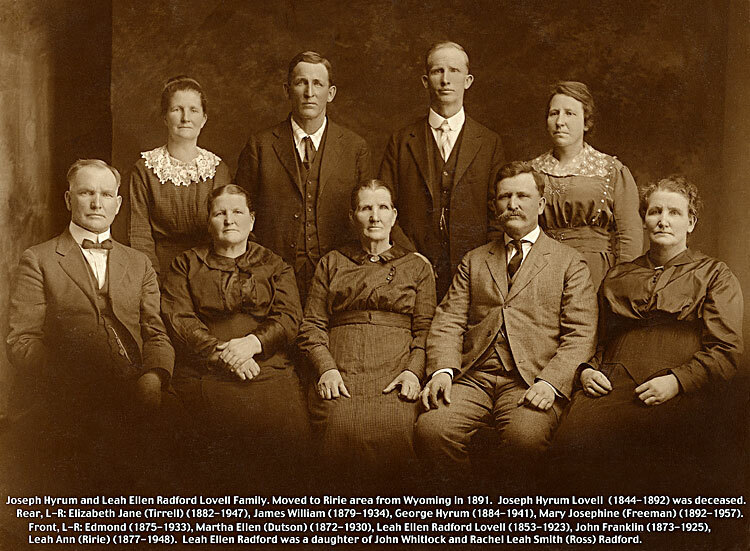 Joseph Hyrum Lovell is not in the family picture above because he died in 1892, just two years after the family left Wyoming and moved to Idaho. Leah Ellen Radford Lovell was a daughter of John Whitlock and Rachel Leah Smith (Ross) Radford. 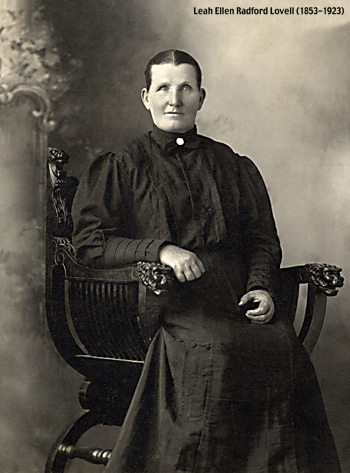 She was born in 1853, married Joseph Hyrum Lovell in 1869, and died in 1923.